Every now and then I have the privilege of meeting someone who has such an incredible faith and passion for serving God that it is impossible not to come away inspired and in awe of God’s abundant blessings. I had one of those occasions earlier this month when I met the founder of Christians Against Poverty (CAP), John Kirkby at the Conservative Christian Fellowship’s monthly Westminster Briefing event. 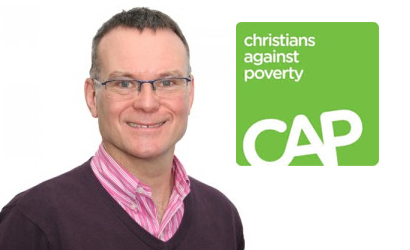 John had been invited to talk about the work of CAP which works across the UK lifting people out of debt and poverty through their free debt counselling service. In the end he spent most of the time going through his life story and the road that led him to forming CAP. It’s such an amazing story that I thought it would be worth sharing some of it here. John Kirkby was born in 1961 and grew up in Heckmondwike, West Yorkshire. Although his parents were Christians, he had little interest in church as he grew up. He spent much of his teenage years rebelling, developing an increasingly destructive relationship with the classic combination of drink and drugs. At fifteen he made up a National Insurance number in order to get a job at a paint manufacturer fitting lids onto the paint tins. Over the following years he worked through a series of apprenticeships and jobs discovering along the way that he had a strong entrepreneurial streak. At the end of his teens, he began a job as a debt collector and loan salesman for a finance company called Avco Trust. Over the next seven years he worked his way up through the company until he was running several of their branches. After moving on, John set up a number of businesses including a financial services company, a loan brokerage firm and what became the largest sun-bed retailer in the North of England. Through his success he was able to fund a lavish lifestyle including a large home, cars and holidays. However through a series of mistakes and excessive borrowing to finance his businesses, John’s world soon began to fall apart as the banks started to ask for their money back. In 1992 he was advised by his accountant to declare bankruptcy. He avoided doing so, but lost virtually everything and found himself with debts of £78,000 and nowhere to turn. One thing John was left with was a house he had acquired through a property deal. It had a huge mortgage and he was desperate to get rid of it, but instead ended up renting it out to a pastor and his family who had recently moved over from Norway. John gradually got to know them and one day, when he visited to collect the rent, they offered him a Bible and invited him to attend their church. He accepted was so overwhelmed by the experience that afterwards he gave his life to God. Having encountered Jesus, John found himself desperate to share God’s love often going to the Bradford Royal Infirmary talking to and praying for ill people he met there. John said at this point as he was speaking that you would expect him to say that after becoming a Christian his life started to transform and went from strength to strength, but in fact his circumstances worsened. His precarious financial situation began to deteriorate and his marriage of twelve years failed. During the following year his life completely fell apart. He became destitute, hurting, lonely and afraid. He was left camping out in a friend’s bedroom. His two young girls would sleep on camp beds in the room when they came to visit. He was struggling just to find the money to feed himself and his children, regularly relying on the kindness of his family and friends at church to get by. After hitting rock bottom, John gradually began to sort his life. He was able to find a job at a financial services company that he had helped found several years earlier. This position paid enough to allow him to considerably reduce his debts, but it also made him feel increasingly uneasy about the business of lending money. He often had to deal with people who were unable to pay back the money they had borrowed and were really struggling. His Christian instincts were telling him to help them and do what he could to reduce their payments. In March of 1996, two years after finding work again, John decided that he needed to make a choice; either carry on as he was or put his life in God’s hands and see where it would take him. He believed God was calling him to sacrifice his career in finance and use his knowledge of the industry to help the poor. He chose the latter and soon afterwards finished working for the company. Following that, his intention was to set up either a Christian building society or finance company, but during a telephone conversation with someone he had never met he was asked what he could do that wouldn’t require any start-up funds. As soon as the call was over he went to his computer and typed in ‘debt counselling’. As the weeks progressed he prayed and studied the Bible along with researching money advice. He registered a charity using the name Christians Against Poverty. In August, armed with a lot of faith, but no money except a £10 gift, CAP was launched and in September, John met his first clients. God was about to put all of John’s experiences of debt, poverty, personal breakdown and dealing with finance to very good use in an amazing way. The miraculous story of how CAP grew from these humble beginnings into a large and respected charity is another story entirely. It is full of incredible faith, answered prayer and God’s repeated provision. John’s book, Nevertheless, which is available for free from the CAP website explains how CAP grew at a remarkable pace, with thousands of clients being set free from crippling debts. Seventeen years on and CAP has grown to be one of the most respected organisations involved with debt in this country and has won many awards for its work. Sister CAP organisations are now running in Australia, New Zealand and Canada. It works alongside some of our largest financial institutions such as Barclays and Lloyds providing advice for their debt recovery divisions. 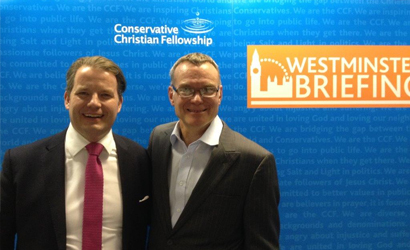 Before speaking at the Conservative Christian Fellowship’s Westminster Briefing, John Kirkby had met with the Archbishop of Canterbury, Justin Welby to discuss how CAP can support the Church of England in rolling out credit unions over the coming years. CAP has 230 employees at its head office in Bradford along with numerous others employed by churches to run debt centres of which there are now 239 around the country. CAP provides debt help for 26,000 people in a year. In 2012, 1,658 clients became debt free. CAP’s money management course, the CAP Money course runs in 1,029 churches and in the 12 months of 2013 around 10,000 people will have completed it. CAP also runs a Money Youth course for schools to teach financial management along with CAP Money Students for those at university. In March, CAP Job Clubs was launched. There are now 72 of these centres helping people find work. CAP’s expenditure for 2012 was £7.2 million, but not a single penny of funding is provided by the Government. CAP runs entirely on donations with 22,000 regular givers (known as Life Changers). During the financial crash of 2008 John Kirkby was asked by a politician how CAP would be able to keep going in the financial climate. He replied that he was not worried because his funding came from God! Since then, whilst many charities and state services have cut back, CAP has trebled in size. This is a testament to the generosity of God’s provision through an increasing number of people who support and believe in CAPs work. CAP is always open about the fact that it is a Christian organisation. The lack of state funding does actually mean it can be more open about the faith aspect of its work. CAP will work with clients from all backgrounds and faiths, but its staff want to give others the opportunity to learn about and experience God’s love. With the permission of clients, CAP staff and volunteers talk about Jesus passionately and directly. As well as the offer of prayer, every client is given a befriender from a local church – this person will be with them throughout the often long journey to become debt free. In the last year 500 people have become Christians through the work of CAP. The story of John Kirkby and Christians Against Poverty is one full of God’s grace and mercy. Those in need are provided for in practical and life-changing ways and God’s love is poured out in abundance. It also demonstrates how God can turn our failures and the painful experiences of life into something powerful when we put our faith in Him, potentially using it to bless many others in ways we cannot begin to imagine. ‹ Has Justin Welby become the nation’s conscience personified? I worked with CAP in Cornwall for a short while – from what I have experienced it’s a magnificent organisation, both gospel-centred and completely ‘real world’ practical. It’s a missionary organisation that happens to specialise in debt-counselling & financial management. Our church saw people saved and transformed having come to faith through CAP – the CAP centre manager was one of the most evangelistic people I’ve ever met – which in turn created a greater hunger to do mission through the felt needs around us. It’s not perfect – any organisation based around volunteers will have issues with ‘getting it right’ – but CAP is manifestly part of the solution, not part of the problem. Thank you. That is very much my impression too. I’ve not heard any serious criticisms against CAP that have any value. They are an outstanding organisation and I have no reason to say that other than I beleive it to be true. I was saddened by Helen’s comments having seen the good work that CAP are doing including bringing many to a REAL faith in Christ. I think she needs to understand that the Gosple is action as well as words and surely the fact that Christians have shown love and care for needy people is exactly what Jesus would have wanted. He was concerned with both body and soul.